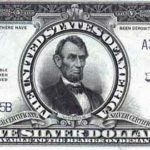 For the first three decades of the 19th-century, the gold half eagle and silver half dollar were the workhorses of national commerce. Ironically, few saw daylight, spending their lives nestled in darkened vaults as bank reserves or disappearing across the Atlantic as international payments. Foreign silver pieces, underweight foreign gold coins and fractional banknotes served as retail currency in daily life. U.S. gold coins, whose bullion value on worldwide markets exceeded their face value in silver, experienced continual melting throughout the era. 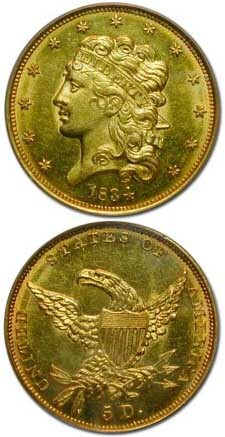 Suffering the worst destruction was the one gold coin minted during the years of heaviest melting, the Capped Head half eagle of 1813-1834. Congress finally addressed this untenable situation with the Mint Act of 1834. Drastic and long-lasting changes were now in store for the nation’s gold coinage. All gold coins were reduced in weight to a point where they would circulate for the first time since 1795. U.S. Mint Director Samuel Moore was eager to get the new gold coins into circulation while withdrawing the pieces of 1795-1834 remaining in public hands. Expecting huge demand for the new issue (the Mint received old-tenor fives at a value of $5.32), Moore ordered Engraver William Kneass to prepare an entirely new design. Kneass created a tousle- haired Liberty facing left, her thick and curly locks confined by a headband inscribed LIBERTY. The date was placed below and a circle of 13 stars surrounded the handsome, youthful head. The reverse continued the raised-wing eagle of the previous issue, surrounded by the inscriptions UNITED STATES OF AMERICA and 5 D. Congress recommended identifying the new coins by placing the date AUGUST 1, 1834 on each, but Moore preferred omitting the scroll with E PLURIBUS UNUM used since 1807. This Classic Head design is distinctly boyish, but a more attractive concept than the similar head used on John Reich’s large cents of 1808-1814 and half cents of 1809-1836. All actually resemble youthful male athletes of ancient Greece rather than a female goddess of Liberty. Kneass’ concept never seemed to fully satisfy Mint officials, and some minor but continuous changes appeared throughout the series’ run. As Kneass faded into ill health and reduced activity, Christian Gobrecht tinkered further with the design in 1836. Variety collectors will find the Classic Heads a less busy field than the first issues of United States gold. Within the series’ five years there are more than a dozen distinct varieties, including changes to Liberty’s hair, and such variations as plain or crosslet 4s on the 1834 coins. Over 2.1 million Classic Head half eagles were struck between 1834 and 1838, nearly all at the Philadelphia Mint. In 1838, new branch mints began operations at Charlotte, North Carolina and Dahlonega, Georgia. These coins have their distinctive mint marks on the obverse over the date. Charlotte (C) placed its mint mark on 17,179 coins. The entire output of Dahlonega (D) comprised only 20,583 pieces. The Mint’s purpose was to return gold to daily circulation, and in this Director Moore enjoyed great success. The withdrawal of older coins was amazingly successful, with an estimated $8,000,000 in pre-1834 gold marching to the smelter for rebirth as Classic Head coinage. The new coins were of the same size and weight as the later Coronet Head coins designed by Christian Gobrecht, so they remained in circulation for many decades after their release. The severely limited mintages of Charlotte and Dahlonega have always attracted collectors, especially after publication of Augustus C. Heaton’s 1893 treatise on collecting by mintmarks. Although Philadelphia half eagles were struck and circulated in adequate numbers, mint state examples of any date are highly elusive to very rare. Well-worn examples in the Fine to Very Fine range are generally available, though these often bear severe contact marks in addition to wear from circulation. Wear first appears on Liberty’s hair, particularly over her eye, and on her cheek. On the reverse, check the eagle’s wings and head. Few if any hoards of high grade Classic Head half eagles have been found. Although the great Louis C. Eliasberg collection contained 11 Classic Heads, only 1834 and 1835 were Uncirculated, and one of his 1834 Plain 4 coins was cataloged Proof-60. 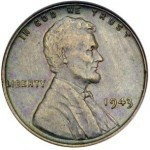 The remaining examples went from Choice About Uncirculated down to EF-45. Gem examples of Philadelphia issues do exist, but only 1834 Plain 4, and to a lesser extent, 1836, are seen with any frequency. The “key” date of the series is 1838-C, difficult to find in any grade and equal in rarity to many pre-1834 issues. Even more elusive is the scarcest variety of the series, the 1834 Crosslet 4trailed closely by the 1838 Dahlonega coin, another “stopper” in mint state. A minuscule number of proofs exist of the Philadelphia dates, perhaps as many as 12 examples for 1834, three of 1835, two of 1836, and one each of 1837 and 1838 (the 1837 specimen is in the Smithsonian). Such coins are extremely rare and have appeared only in one or two of the great “name” auctions in recent years. 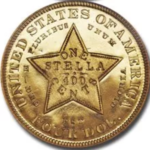 The generally dismal grades so frequently encountered may prejudice collectors against this series, but all pre-Gold Rush coinage is usually found in similar condition. A collector taking the opportunity to view a high-grade example objectively, however, will discover that the Kneass design is really a bold example of America’s primitive neoclassical art. By 1838 this vintage design would yield to the wave of highly stereotyped motifs, such as Gobrecht’s Coronet, that improved the coins’ mechanical qualities but eliminated much of the life and vibrancy found in the earlier issues. The Classic Head half eagle circulated during times of significant economic disturbance. In the early 1830’s the country enjoyed a wild ride, including intense speculation in Western lands and a fungus-like growth of totally unregulated and frequently shaky private banks. 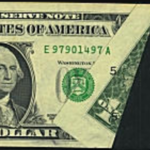 More destructive to the economy was the vast expansion of often unsecured paper money issued by the same banks. The Federal government’s major financial preoccupation was not a deficit but the huge surpluses piling up in each year of apparent prosperity. Trying to regulate runaway land speculation, President Andrew Jackson’s Specie Circular of July 1837 decreed that only gold or silver coins would be accepted for purchases of public lands. A business panic beginning in England in March of 1837 rapidly spread to the United States, and the last years of Classic Head coinage saw the disastrous depression known as the “Hard Times.” While hard money advocates such as Missouri Senator Thomas Hart Benton argued the pros and cons of Jacksonian monetary policies, hundreds of thousands of Americans starved in the winter of 1837-38. To them, a $5 gold piece would have represented breathtaking wealth in times that saw 90% of American factories idle. To these Americans, copper “Hard Times” tokens were far more familiar than gold coins of any denomination. 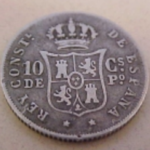 1715 Plate Fleet Spanish 2 escudos?